I have a tendency to forget what products I have unless they are blatantly laid out in front of me so this idea was quite good for me as I really can't forget. So far so good as I have tidied up my fingers and toes as well as giving myself a lovely facial today and I'm only on day 1. ▼Burt's Bees Radiance day cream with royal jelly. ▼Rimmel London Trio in 747 Dark Angel. ▼Nails Inc Polishes in Holly Walk, Callow Street, Belsize Avenue, Belsize Park, London, Hoxton Crackle, Hampstead Gardens, Prince of Wales Drive, St James, Shoreditch, Henley Regatta, South Molton Street, Victoria & Albert. 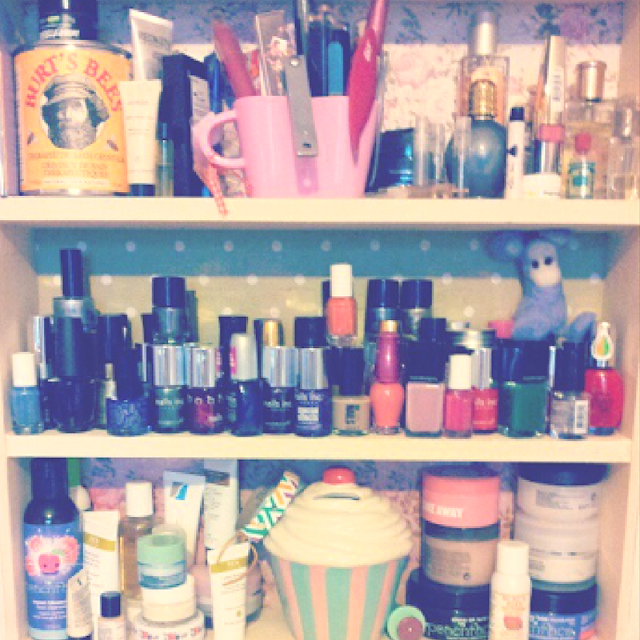 So here's to empty bottles and lots of new exciting products taking the empties place on my little beauty shelves. If there are any products listed that you want me to review or to do a little YouTube video on please let me know as I'm happy to do so. Lovely collection :) I'm just planning to make a cute storage for my own these days. Fab little storage idea beautiful. I'm trying to work out at the moment how to home all beauty items - I might attempt some DIY, ha ha ha (or get someone else to do it for me) more like! What are us girls like ey, can never get enough beauty products!